On Monday April 8, Cobourg will have a public meeting to accept comments from residents about the proposed Strategic Plan for the next term of council – 2019 to 2022. Basically, the Strategic Plan lists what the Council hopes to achieve although it does not specifically address budgets. Council spent a good day and a half in February developing the plan – see the report in the link below. Since then, the Town’s web site has had the plan available for comments. The Agenda for Monday’s meeting lists 35 written submissions. I have listed all of them below (including links) plus a summary of each. Many of them object to even thinking about adding boat slips in the West Harbour, some ask for actions that are not within the Town’s jurisdiction (e.g. garbage issues) and others have unrealistic expectations (e.g. railway underpasses on Brook and D’Arcy). At the meeting chaired by Mayor, John Henderson, verbal submissions will also be accepted. There is no provision for a debate by Council on submissions – that will happen at the following Committee of the Whole meeting on April 23 when additional public submissions will also be accepted. Final approval is scheduled for the regular Council meeting on April 29. Note that “quotes” indicate a direct quote from the submission. The addition of “(sic)” indicates that the quote is not a mistake – what is shown is what was provided. John Cairns – “Perhaps more cost centers should be put on a ‘Fee’ basis for those that use.” This would include the beach, Victoria park and the dog park. Transit busses should be smaller and fares increased; close underused parks. Get new employment opportunities with better than average paying jobs. The team should work on doing the “need to do” not the “nice to do”. The plan is a laundry list of 26 ‘priorities’ that seem disjointed and hard to measure. The town needs to get better at doing the things it already does, and/or decide what not to do. The Town should not focus resources on a Culture plan – first fix the recreation program. Basic recreational programs are not advertised well, not setup properly in the online registration system, not run well, or the customer service staff are not providing very good registration support. All funds available to the Town should be used wisely with transparent accounting. Judy Smith – Glad to see the emphasis on sustainability and developing the climate change plan. Re-invent 1st Street (now a little used lane) as a bright paved walkway leading from Downtown to the Harbour and Beach. Flags, Food Trucks, etc. Encourage patio culture along King Street with Bright Umbrellas etc. Cobourg has a history, and plenty of Heritage Buildings from the 19th Century, but emphasize some modern architectural daring on new buildings. No strip Malls, unless they accommodate affordable housing above or within the Parking areas. Giant parking lots are a waste of land. Under the category of “People” the word “Social ” could be modified to be “socio-cultural “. Tourists don’t necessarily want to spend money when visiting places …. Maybe it is best to preserve Cobourg and its beauty for the people who live here. David Blakely – Metrics could be improved; assessing of current situation is not accurate; plan needs to talk to ways to help those on social assistance; why do many local professionals live elsewhere? Andrea Storm – I am disturbed that the draft strategic plan includes additional boat slips in the west harbour. Bruce Bellaire – Should mention active transportation; surprised to see another review of the expansion of boat slips into the west harbour. Christine Young – Absolutely against expansion of the marina in to the west bay. Colin Junkin – I support this plan – my main concern is with available transient slips in Cobourg we keep it at a way higher # than average than anywhere else on this lake which means less slips for permanent. Why? What is the practical reasoning? Frank Godfrey – Please, no more talk of marina expansion into the west harbour. Please put an end to this Trojan Horse. Kevin Siblock – The environmental and recreational impacts do not reflect what 4 people in our household want in a town. Michele Peterson – Expansion of boat slips into the west harbour would require more dredging so funds must be allocated to assess the impact of this on the marine environment and health of Cobourg residents. Dredging might also impact Blue Flag Beach certification. Winston Emery – The Bicycle Action Committee supports some aspects of the plan such as prioritizing “biking, walking and public transportation to mitigate climate change effects.” When exploring “the feasibility of enhanced sidewalk snow clearing”, “clearing of arterial bike lanes and multi-use paths” should be added. The document considers culture as an industry or commodity but misses the dimension that “culture” is also an ideological construct – for which education is key. Yet no reference is made to public education in “Programs and Prosperity” strategies. “Overall, while we find much to support in the Plan, given the urgency of environmental sustainability, housing and physical and mental health, we wonder about the reasons for according priority to technological communications improvement”. we have a responsibility to embed sustainable thinking in every single municipal decision. Cobourg has a litter problem. Solution – posted signs indicating litter fine, min. $100 to $500. Northumberland Forest x-c ski trails would help with “Four season Destination” but trails need to be groomed. Solution: fee box in parking lot. Emergencies: Evacuation signs to identify route. Growth in senior sector. The only part of the CCC that is in constant use is the walking/running track. Institute a $2/day user fee. Put proceeds toward an outdoor paved pathway system. Arts & Culture. One central website where we can find current entertainment in town. Ian McKelvey – I think that adding more boat slips is not a good idea. Jeremy Fowlie – No expansion of slips into the West Harbour. Leave it alone for all to enjoy. MEMO to all the “immigrants” from the city who have made Cobourg their home: Cobourg is NOT a city, it has retained its designation as a town. As in “Town of Cobourg”. We have no “city hall” and no “city officials”. Every time I see a comment containing either of those two phrases it tells me it’s not a “real” Cobourgian making it. And another thing: if you’re going to stay here longterm it’s important to understand the difference between the Town and the County and what roles each level plays in local governance. Hint: each County is set up differently so the division of responsibility is different in each. How Peterborough County operates is not the same as how Northumberland does it. And another thing: if you’re going to stay here longterm it’s important to understand the difference between the Town and the County and what roles each level plays in local governance. Considering the numerous comments regarding Cobourg providing affordable housing there are many who don’t understand that this is a County and not a Town issue. Even some who have lived in Cobourg their entire lives are confused. The electorate decided that it should be a Cobourg issue in the last election. The County runs a program but the Council in Cobourg decides whether to do more – they have decided to do so. Tell us Deborah OConnor, what is a “real” Cobourgian? Do you have the same attitude about “immigrants” when it comes to “real” Canadians? You sound like “you know who”. Obviously not you Frenchy, the description is Cobourger! Obviously not Deborah OConnor either, I was quoting her! Good to see housing put on the front burner. 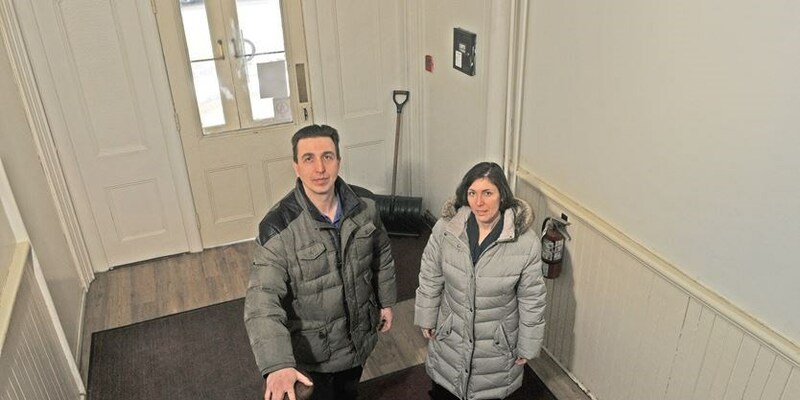 Read the story in Northumberland News about the couple who bought 5 downtown properties properties and is revitalizing them. The Downtown Cobourg Vitalization Action plan has money to support exactly this endeavour. Ashley Purdy, the communications manager for the Town of Cobourg, has said council has not granted final approval for the CIP program yet, but said that $75,000 is being proposed for 2019. That is a 50 per cent decrease in funding available for projects when compared to the $150,000 that was approved in 2018, which resulted in seven recipients being granted funds. Driving with one foot on the gas and one on the brake. It will also be interesting to see how getting more heritage districts set up and more apartment housing downtown will play out.